Perfection — minus 21 stitches. A few weeks ago, Mr Knitting Theologian requested a vest to wear over his shirts at work. He was rather specific about what he wanted : something relatively close-fitting, grey, in a non-scratchy wool. I spent some time on Ravelry and found a pattern we both liked (Aspen). On a work trip to a Real City (we live on the country), I took some time to stop at a yarn store where I found some gorgeous, squishy and very soft grey merino yarn — and Mr Knitting Theologian liked it very much. Then, on a quiet evening, I settled on the sofa, did some maths to knit the vest in the round as he didn’t want a front opening, and cast on. It was wonderful. The wool knit to a magnificent fabric. There was enough plain stockinette to be a quiet and meditative knit, and two nice cables on the front to keep it interesting. Very quickly, it became quite addictive. I spent every free minute I could find knitting on it. The more it grew, the more I loved it. A soft, cushiony wool ; a deep, not quite solid grey ; a dense, very even texture ; everything about it was pure pleasure. 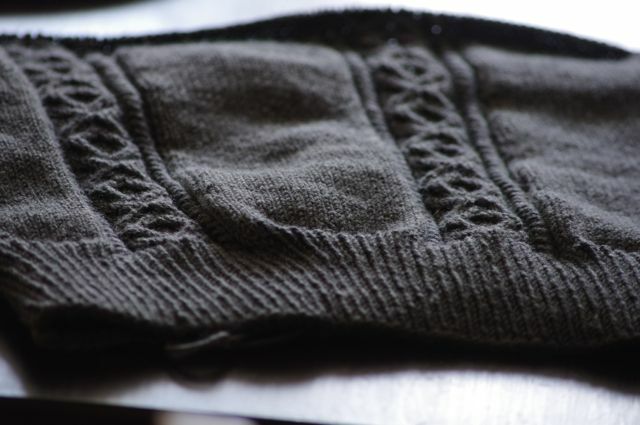 On Sunday, I had knit enough of it to bind off stitches for the armholes and knit the front and the back separately. And that is when I realized there should have been 21 more stitches between the two cables on the front. At first, I was, of course, angry and frustrated. I think I even said something along the lines of “This knitting thing will make me crazy”. After a few moments, though, I remembered it was Palm Sunday, the day hundreds of people gave up their coat — their only coat — to pave the road into Jerusalem for Christ, out of sheer joy and love. Ripping thirty-two centimeters’ worth of perfect knitting wasn’t half as impressive a thing to do. What I remembered too, instants later, was that this was not just knitting. This was — this is — Pleasure. Doing it all over again would be more bliss than frustration, time spent not only creating a beautiful thing but also feeling that soft yarn between my fingers, pressing my cheek against that beautiful, smooth fabric, making stitch after stitch not only with a wonderful yarn, but with joy and with love, with joy at making something beautiful for someone I love. Because sometimes, knitting is that good. This entry was posted in Knitting and tagged cables, in-the-round, merino, vest by Julie Paik. Bookmark the permalink.